Blueberry Ingredients: Cultured Pasteurized Grade A Low Fat Milk, Sugar, Modified Corn Starch. 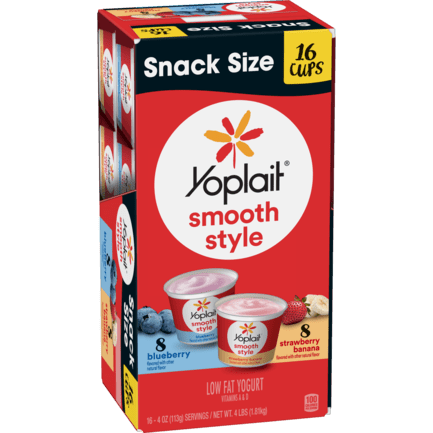 Contains less than 1% of: Modified Tapioca Starch, Vegetable Juice and Fruit Juice (for color), Natural Flavor, Potassium Sorbate Added to Maintain Freshness, Vitamin A Acetate, Vitamin D3. Strawberry Banana Ingredients: Cultured Pasteurized Grade A Low Fat Milk, Sugar, Modified Corn Starch. Contains less than 1% of: Modified Tapioca Starch, Citric Acid, Natural Flavor, Vegetable Juice (for color), Potassium Sorbate Added to Maintain Freshness, Vitamin A Acetate, Vitamin D3.